FESPA UK Association board member Graeme Richardson-Locke has visited the ‘Printerns’ that are being sponsored by the association to help fund their screen printing internships. Print Club London, was established in 2007 and is run by managing director and illustrator Fred Higginson and director Kate Higginson. The duo works closely with iconic illustrator and creative director Rose Stallard, who brings the Print Club brand to life with her inimitable 1970s fanzine-style-artwork and edgy typography. Alongside running the studios, Fred, Kate and Rose also curate an annual exhibition ‘Blisters’, one of the UK’s largest screen printed poster shows that introduces a wider audience to affordable, original artwork. Whilst providing studio space and selling work is a key focus of the studios, the trio work with clients on projects ranging from bespoke bags for Stella McCartney to live printing projects in store with Nike. 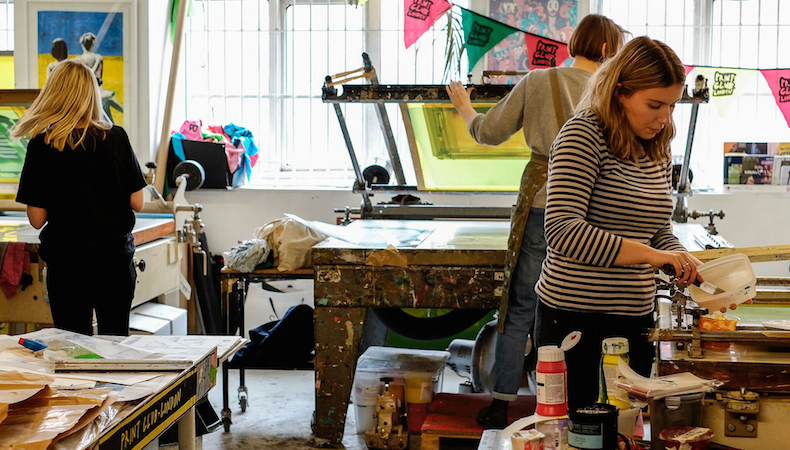 Graeme was very impressed by the drive and enthusiasm at Print Club London for screen printing and their achievements in filling the gap left by art colleges and their restricted access to print facilities. The FESPA UK Association board agreed to sponsor the ‘Printerns’ and welcome Fred, Kate and the team as the association’s latest members. On arrival to Print Club in Dalston, located at East London, you enter down a side road to access the studio building, which is opposite a stack of shipping containers with graffiti by a former member. Another wall has screen printed wheat pastes, full of colour by Donk, a London street artist. It sets the scene for a warm welcome into a busy office where the staff all clearly love what they have built. Once the introductions had been made, gallery manager Amber Henryt took Graeme to meet the printerns. The first was Charlie Gould who studied Illustration at Southampton University. He presented his work and ideas inspired by his passion for iconic movies and an illustrative style based around the use of a simple palette of layered translucent colours reminiscent of Mexican woodblock prints. Gould is thrilled to have been selected by Print Club to pursue his screen printing ambitions, ready to begin in May with his first edition. The second printern was Niall Greaves whose interest in screen printing began with improvised equipment in his family home. His first print experiments were made with a sun lamp to expose the screens that were washed out in the bath. Greaves is inspired by the old punk posters by designers like Jamie Reid and a love of abstract forms. Coming from Newcastle college and Bristol University, Greaves was also very pleased to be supported by Print Club’s scheme that will enable him to create his editions and master the skills of screen printing. Graeme was also very pleased to share some of his 30 years-experience in screen and digital printing. "One of the main advantages of joining the FESPA UK Association is the access it provides to its community and expertise," he commented. "When a technical question arises, either concerning process, health and safety or sourcing, the help is there on the phone or through the website. Whilst the association’s membership is very diverse, it is made up of people in businesses that believe in the value of community."